Why Is An Obscure Study About Lyme Disease-Causing Bacteria So Popular Online? Scientific American is among the many mainstream outlets that discussed the findings, which may represent a major step in making the ever-gray world of Lyme disease science more black and white. "Who knew there would be so much interest in a biomechanics paper??!!" 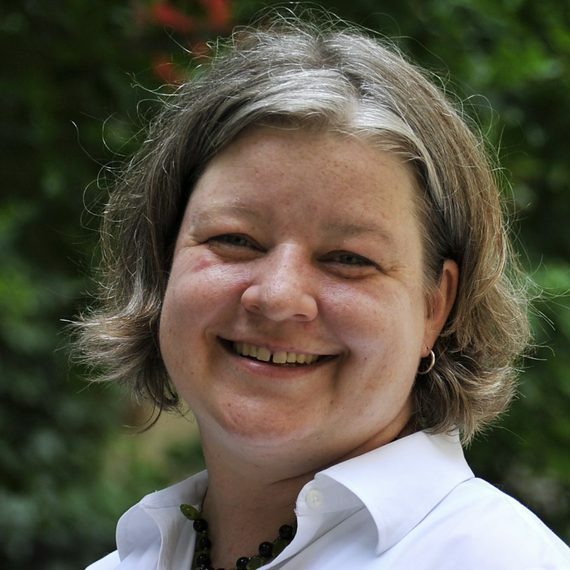 Those are the words--and the multiple exclamation points--of Tara Moriarty, proprietor of the Moriarty Lab, an infectious diseases research lab that studies primarily Borrelia burgdorferi (Bb) the bacterium that causes Lyme disease. Moriarty is the principal investigator of a new academic paper from the University of Toronto that details the mechanism by which Bb "crawl" through the body. Understanding the movement of an infectious disease agent may seem unnecessarily technical to many people, but Lyme disease patients and specialists see hope in this would-be obscure study--and despite Moriarty's surprise over the popularity of her paper (now among the top three percent of all papers ever tracked by Altmetric, a service that analyzes online activity surrounding scholarly research publications), she knows it's not because of a latent popular interest in the mechanics of disease-causing microbes. "All of the interest," Moriarty says, "is because it's [about] Lyme disease, and although there are some biomechanics folks following it, all other followers are biologists (mainly microbiologists), and hugely, members of the Lyme disease advocacy and support communities." Under Our Skin 2: Emergence is a documentary that addresses the complexities and controversies surrounding the Lyme disease epidemic. Understanding the behavior of the bacterium that causes Lyme disease is essential to figuring out how to treat it effectively--just as figuring out how HIV works was essential to preventing the development of AIDS. A little context for the uninitiated: Lyme disease is a complex illness that is arguably the most politically controversial disease since the emergence of HIV/AIDS--and one of the most widespread. I interviewed Moriarty by e-mail, and that interview follows, but before I get to it, here are a few Lyme basics to lend context to the discussion. In summary, Lyme disease is the most rapidly spreading infectious disease in the country, newly infecting over 300,000 Americans every year. The CDC-endorsed blood tests miss a great number of infections for various reasons, which has resulted in states such as Virginia passing laws that require physicians disclose to their patients that a negative Lyme disease test does not necessarily mean that a patient does not have Lyme disease. For that reason and because of the great variation among patients' symptoms, a huge number of Lyme disease infections go undiagnosed and untreated. Lyme disease (left) and syphilis bacteria: "They look alike, they talk alike, at times they even walk alike." The bacterium that causes Lyme disease is related to the one that causes syphilis, and the symptoms of untreated, progressive Lyme unsurprisingly are likewise similar, ranging from nerve pain and arthritis to severe neuropsychiatric dysfunction and deadly sudden heart failure. The last of these symptoms is still thought to be very rare; however, in 2012 and 2013, the deaths of three relatively young Massachusetts residents (ages 26-38) were discovered by a coroner to have been caused by Lyme disease. None of these patients had been diagnosed with Lyme while alive, although one was prescribed medication to treat sudden-onset severe anxiety (a common and commonly dismissed Lyme symptom) the very day before his sudden death. Many people who live with Lyme disease (in full disclosure, I belong to this group) report a vast array of symptoms that often are far more severe and life-affecting than a casual broadcast news viewer would be led to believe--and more severe and life-affecting than public health services such as the CDC in the United States and national health agencies in many other countries, including the United Kingdom and especially Australia, acknowledge. All of this is simply an explanation for why an academic paper about the biomechanics of the Borrelia burgdorferi bacterium is among the most-read online scholarly articles. People are suffering and, probably in many more cases than are reported, dying from Lyme disease--and those at risk want to know why. Moriarty and her coauthors are helping us to understand that. Scientific American reported that your study found "The tiny, spiral-shaped bacterium called Borrelia burgdorferi can quickly grapple along the inner surfaces of blood vessels to get to vulnerable tissues or to hiding places where it can hole up beyond the reach of drugs." Have any other bacteria or invasive pathogens shown similar behavior/movement? Moriarty: Unfortunately, in our interview for this article, we didn't actually say that B. burgdorferi can use dissemination to reach hiding places beyond the reach of drugs. The structure of the sentence in this article sounds as if we did say this, but we didn't actually study how dissemination affects vulnerability of these bacteria to drugs, or intend to say that dissemination affects susceptibility to treatment (please see below about this concern too). We were studying the biomechanics of how B. burgdorferi adhere to blood vessel surfaces. In theory, yes, something that makes it easier for bacteria to stick to blood vessels under high force might make it easier to get to some tissues. For example, the force caused by blood flow is higher in the brain than in many tissues. However, we did not conduct our studies at the range of force found in brain blood vessels, so the mechanisms we found are probably more important for blood vessels in other tissues and organs. We know, for example, that white blood cells use special mechanisms to adhere to blood vessels in the brain. It's likely that Borrelia would need something special to do this too, but this mechanism hasn't been discovered yet. It is well known that many antibiotics do not cross the blood-brain barrier very effectively, and that some antibiotics don't penetrate bone, which can make antibiotic treatment in these tissues more challenging. Generally, when the efficacy of antibiotics in treating specific infections is studied, if these infections affect the brain and bone, early studies to determine correct dosing also look at the efficacy of antibiotics in these tissues, to ensure that the dose is high enough to be effective there. Lots of bacteria can disseminate via the bloodstream, but we don't know much about exactly how most bacteria do this, and we certainly don't know how other bacteria move when they're in the process of sticking to these surfaces, or how they overcome the force caused by blood flow. It's the insight into how the bacteria move and overcome the force of blood flow that is really unique about our study. And we've developed methods which will probably be useful for studying how other bacteria stick to blood vessel walls under flow. We do know some things about how other bacteria stick to blood vessel walls, however, even if we don't know as much as we now know about Borrelia. We don't understand how the bacteria initially stick, but once they're there, they often start making sticky substances which form a kind of glue that attracts more bacteria, and which encases the bacteria that are present in a sticky mass called a vegetative mass or a biofilm that can't be washed off the heart valve by blood flow. Figuring out how bacteria stick to surfaces under flow is hugely important for treatment of some of the most serious consequences of some infections. How does this special movement affect the bacterium's survival in the body? We didn't directly study how this special movement affects bacterial survival in the body. It took us 5 years just to figure out how the bacteria stick to blood vessel surfaces! We haven't even got to the stage of measuring survival, although we're starting to work on this now. We know that in people and in mice, Borrelia burgdorferi and related Lyme disease-causing species are found in the bloodstream early in infection, but don't stay there for very long. We don't actually have direct proof of why this happens, but the theory has always been that the blood is a pretty hostile and unprotected environment for these and most bacteria, since the blood is being circulated through major filtration sites in the body (lung, liver, spleen) many times/minute, and the chances of the bacteria being trapped and killed by immune cells in the filtering organs is much higher the longer they live in the blood stream. Also, the blood may not have some of the nutrients the bacteria need to survive and proliferate, at least for B. burgdorferi, which may not be as metabolically adapted to living in the blood stream as the Borrelia which cause relapsing fever, for example. So, according to these assumptions, the ability of Borrelia to stick to blood vessel surfaces using this form of movement and then to escape out into the tissues outside of the blood vessels probably helps the bacteria to survive for longer in the host than they would if they couldn't leave the bloodstream, because they can access sites where they may be more protected than they are in the bloodstream. Long story short--this movement probably is very important for longterm survival of the bacteria, but there's still a lot to do to test this idea scientifically. 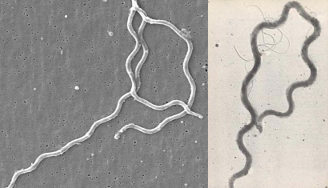 Above: Video of Borrelia burgdorferi bacteria showing "swimming" in a corkscrewing movement typical of Lyme disease, syphilis, and other spirochete-type bacteria. The new study describes a different kind of movement by which the bacteria "glue" one end to a blood vessel, detach and then attach the other end, and inch along the vessel in a caterpillar-type movement that may prevent it from being swept away by blood flow and therefore making it more resilient inside the body. Prior to your study, was it thought that all Bb bacteria were "free swimming" in the blood, or was there any evidence that the bacteria might be able to evade blood flow? That's a really good question. There's actually been quite a bit of evidence that Borrelia sticks to blood vessel walls. What was special about the study we're discussing is that we figured out some aspects of exactly how they manage to stick. We've known dating back more than 30 years now that B. burgdorferi can stick to the cells which line blood vessels, endothelial cells, if you grow these cells in a dish and add the bacteria to them without any kind of flow. There were some early, amazing electron microscopy and other studies which demonstrated that these interactions occurred. Then, as time went on, researchers started using other kinds of methods to figure out how Borrelia stuck to endothelial cells, but none of these studies were conducted under the kinds of flow-induced force conditions that are actually present in the vasculature (although some of the findings of these earlier studies turn out to also apply to B. burgdorferi interactions with endothelial cells under flow too). There's lots of previous direct and indirect evidence that these bacteria can evade blood flow by sticking to endothelial cells, and we even knew some of the proteins that were involved in this. The trick was that we still didn't know exactly how this sticking happened, and how exactly the bacteria moved when this was happening. This sounds like a trivial detail, but it's not, because it's the seemingly tiny details of how something like this happens that are actually key to figuring out how to stop it from happening. This interview was abridged for brevity and to streamline some of the more technical information. In the second part of my interview with Moriarty, we will discuss a bit more of what most people want to know: how this study's findings may impact the Lyme disease epidemic.